Normally, I love thick paintings. Canvases piled high with mounds of paint and lots of gooey and delicious texture. But there is a fluidity in abstract watercolors that I find just as appealing. Watercolorist Marsha Boston imbues her work with such a lovely sense of light and tranquil color, they feel like looking at the world from under a blanket of warm water as the sun shines above. Her botanical work focuses on our relationship with nature, our power over it in areas such as genetic engineering and nano-agriculture. How easy it seems to be for man to take for granted and ultimately destroy the delicate balance that is inherent in the natural world, all for our own purposes. Her Remembering Water series stemmed from the disastrous Deepwater Horizon oil spill, spawning an interest in aqueous plants and their usefulness and value in our ecosystem. When oil spills occur, much is made of the impact on animal life, but the harm to plants and microorganisms that sustain them is rarely highlighted. I love art for art’s sake and pretty pictures as much as the next girl. But do you know what I love even more? Beautiful artwork that tells an important story. And that’s what Marsha Boston’s work does. It is telling us the story of the destruction and misuse of the very resources that are here to not only sustain us but give us pleasure. It would be a sad day if there were no more wildflowers to inspire artists like Boston to capture their beauty. To see more of Marsha Boston’s work, please visit her website and Facebook page. 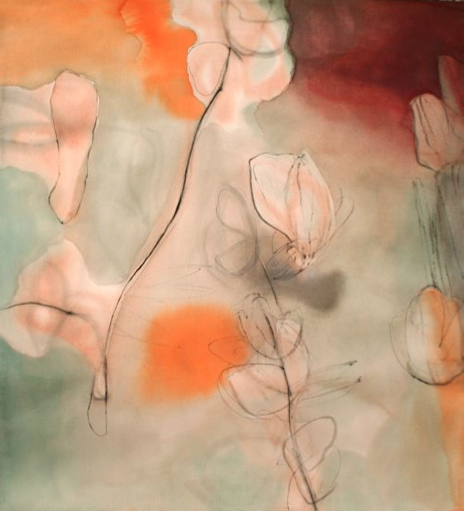 Featured image is Indian Fig, watercolor and ink by Marsha Boston. All images are courtesy of the artist’s website.